Greek and Roman ruins, of course, abound in southern Italy. Those of earlier Italic cultures —the ancient peoples of Italy— are a bit harder to come by since they are overlaid with so much later construction that it has not always been clear what you are looking at. Even the best-known such site near Naples—Pietrabbondante, a Samnite ruin—was long thought to be Roman. Closer to Naples, just north of the town of Acerra are the ruins (such as they are) of what is confusingly called the Oscan/Etruscan town of Suessula (also known locally as Suessola). The term “Oscan” comes from the name of the Osci, an early Italic tribe; the name refers to both the tribe as well as to a language group, also termed either Osco-Umbrian or Sabellic (from which we have the adjective Sabine). The speakers were close Indo-European relatives of those who spoke Latin; indeed, various dialects of Oscan were spoken by central-Italian tribes that were often at war with early Rome. The Etruscans were non-Indo-European immigrants to Italy and started to spread out in Northern and central Italy in the early part of the first millennium b.c. Thus —with all sorts of wiggle room— we can say that at some prehistoric time in Italy, say 700 b.c., Suessola existed as a pre-Roman settlement of Oscan speakers; the settlement was later incorporated into an Etruscan confederation (though not one of the famous 12 Etruscan cities). When the Etruscans faded, the indigenous warrior Samnites, who spoke an Oscan dialect, took over the town. Suessula is mentioned in many sources since it was the site of a famous battle between the Romans and the Samnites in 343 BC. Suessula was on the road from Capua to the straits of Messina (a road later to be known as Via Popilia) and was also important, somewhat later, for the Romans keeping an eye on Hannibal’s movements in the area. Eventually, of course, the Samnites and Carthaginians were defeated and the town of Suessola was incorporated into the rest of Roman Italy. 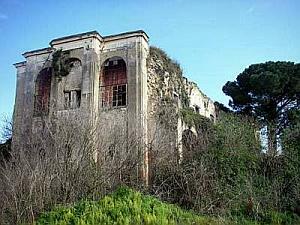 Those woods, much later, became a hunting preserve for Bourbon royalty in the 1700s centered on a hunting lodge called casina Spinelli, now in ruins (photo, above). It is adjacent to an earlier medieval structure called the “Sessola tower” (obviously a variation of Suessula). That the lodge and preserve were actually on ancient ruins wasn’t clear at all until the late 1800s when Oscan tombs were excavated and vases and bronzes were found. The site is mentioned prominently by German archaeologist Friedrich von Duhn (La necropoli di Suessula, in Rom. Mitteil. II. 1887) and later by the Neapolitan archaeologist, Amedeo Maiuri (in Il Fuidoro, year III, issues 1-2, January-June 1956).